This charming Ring Pillow is inspired by the romantic nature of Love Birds. Two affectionate Love Birds are embroidered onto the front of the pillow in a loveable scene set on a tree branch. 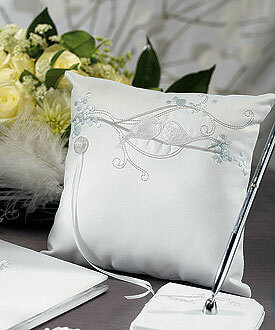 White and grey matte satin fabric with embroidered decoration that includes a subtle hint of blue..